On occasion of Diwali with sprit of positivity and optimism Angle Broking has came up with top 10 diwali stocks. 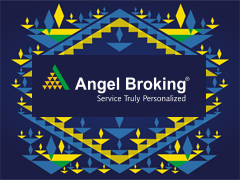 Let’s look at what Angle Broking says about Top 10 Diwali Stocks. Wipro has operating margin levers such as improving utilization level and increasing offshore revenue. Wipro’s utilization level is currently at at 66.1%, which is nearer to its historic low levels. The company has headroom to improve its utilization by 500bps even if the Management does not want to run a tight ship. ICICI Bank’s strategic transformation over the past five years has expectedly resulted in a significantly better balance sheet and earnings quality. ICICI bank has largely exited unattractive business segments such as small-ticket personal loans in the domestic segment and most non-India related exposures in its international business, which has resulted in a commensurate decline in credit costs for the bank. Bank is targeting to expand number of branches to 3550 by 1QFY2014. For Hindustan Zinc (HZL), we expect zinc-lead/ silver volumes to grow at a CAGR of 5.8%/6.2% over FY2013-15. Also, HZL is expanding its mining capacity at the Kayar mine, which has 11mn tonne of high-grade reserves. The company expects to increase its capacity from 1.0mn tonne to 5.0mn tonne over the coming five years. The stock is currently trading at an inexpensive valuation of 4.6x FY2014E and 3.6x FY2015E EV/EBITDA. On a P/B basis, the stock trades at 1.5x FY2014E and 1.3x FY2015E. We maintain a Buy on the stock. Axis Bank has aggressively expanded its branch network at around 30% CAGR over the past ten years (~2,250 branches now), which has not only aided the bank in steadily growing its retail liabilities profile (CASA ratio stands at ~43% and share of domestic CASA & retail deposits to total deposits at 73%), but has also laid a strong platform for building up a sustainable retail assets portfolio (share of retail advances to total advances at 30%). We maintain our Buy recommendation, with a target price of 1392 Rs/-. Cipla is one of the largest players in the domestic formulation market, with a market share of around 5%, contributing 47% to the total turnover in FY2013. Cipla’s distribution network in India consists of a field force of around 7,500 employees. The company plans to focus on growing its market share and sales by increasing penetration in the Indian market, especially in rural areas, and plans to expand its product portfolio by launching biosimilars, particularly relating to the oncology, anti-asthmatic and anti-arthritis categories. Tata Steel is in the process of restructuring its European operations. Over the past two quarters, its European operations have shown better-than-expected improvement in operating profit. Going forward, we expect European operations to continue to improve on the profitability front, which have been dragging down the company’s consolidated profits in the past. The stock is currently trading at an inexpensive valuation of 5.8x FY2014E and 5.2x FY2015E EV/EBITDA. On a P/B basis, the stock trades at 0.9x FY2014E and 0.8x FY2015E. We maintain a Buy on the stock. 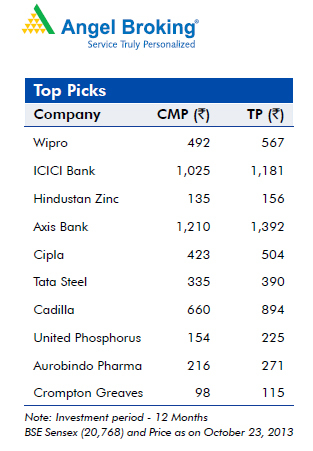 Cadila is the fifth largest player in the domestic market. The company enjoys a leadership position in the CVS, GI, women’s healthcare and respiratory segments, and has a sales force of 4,500 MRs. Going forward, the company expects these segments to grow at above-industry rate on the back of new product launches and field force expansion. While FY2014 sales would be lower, however FY2015 should witness a strong sales growth. We expect Cadila’s net sales to post a 16.6% CAGR to 8367cr and EPS to report an 18.1% CAGR to 44.7 over FY2013-15E. While the growth momentum has slowed down, the stock has corrected significantly, making it attractive. United Phosphorus (UPL) figures among the top five generic agrichemical players in the world, with a presence across major markets such as the US, EU, Latin America and India. We estimate UPL to post a 12.0% and 15.0% CAGR in sales and PAT, respectively, over FY2013-15. The stock is trading at an attractive valuation of 6.8x FY2015E EPS. Aurobindo Pharama is leading pharma company. Aurobindo Pharma (APL) has increased its filing (ANDAs and dossiers) dramatically from 313 in FY2008 to 1,647 in FY2013, as it proposes to scale up from SSP and Cephs to NPNC products. APL has entered into long-term supply agreements with Pfizer (March 2009) and AstraZeneca (September 2010), which provide significant revenue visibility going ahead. APL is also in discussion with other MNCs for more supply agreements. Crompton Greaves (CG) is among the leading players in the power transmission & distribution equipment business. It is a globally diversified company, deriving more than 50% of its order backlog from international operations as of FY2013. The underperformance of the stock in the last few years can be attributed to intense competition in the domestic market, slowdown in European market and restructuring of the Belgium plant which led to execution delays and margin contraction. However, we are of the opinion that CG’s margins have bottomed out in FY2013 and expect operating margin to gradually improve over the next 12 months, partly due to expected recovery of margin in overseas business (aided by cost savings on account of restructuring of Belgium operations and transfer of orders to Hungary plant). So this Diwali let’s light up the diya of optimism, shake off all the negativity and celebrate the good times with purchase selected stock in stock market!